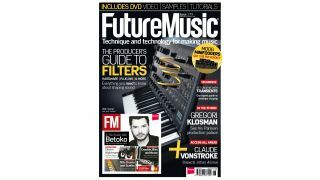 There's a definite sound-shaping theme running through the latest issue of Future Music. It begins in our Producer's Guide To Filters, in which we delve into the science behind one of the most essential, yet easily taken for granted, tools in the modern producer's arsenal. From practical 'fix it' techniques to creative sequencing and sound mangling, we'll guide you through everything you need to know about using hardware and software filters to sculpt your productions. The tone shaping continues with our in-depth guide to Transient Treatments, where we walk you through the essentials of envelope shaping and show you how it can be used to refine and reshape your sounds. As ever, we've exclusive audio examples to accompany everything mentioned above too. Check it all out in the June issue, alongside loads more great features, artist interviews and the latest gear reviews.